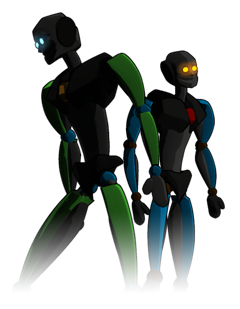 Meet the X,Y,and Z axes. Before we do anything else with bones, let’s talk briefly about a bone’s axis of rotation. All bones (and nulls) can be rotated on three different axes. The axis of every bone is at the base (the wide end) of the bone. You can rotate a bone on just one axis or you may rotate a bone on a second or third axis simultaneously. Each axis has a letter that designates which axis it is. 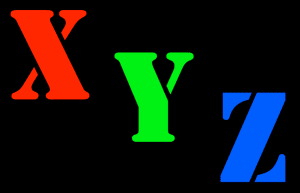 These letters are X, Y, and Z. All of this is important because sometimes you may need to use this knowledge when setting up constraints in a rig. For the following illustrations, I have rotated the bone in the model window to line up with the model window axis. If you are following along with this tutorial in A:M then you do not need to rotate as I have done here. Bone viewed from the model’s Right view. 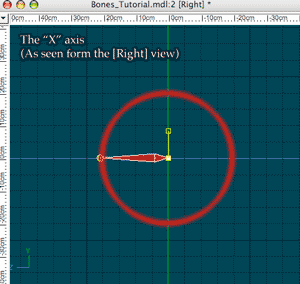 The red circle in the illustration shows the axis of rotation when rotating a bone on its X axis only. The tip of the bone can follow the path the red circle. Bone viewed from the model’s Top view. 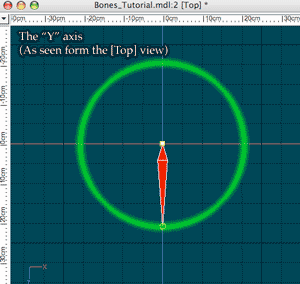 The green circle in the illustration shows the axis of rotation when rotating a bone on its Y axis only. The tip of the bone can follow the path the green circle. Bone viewed from the model’s Front view. 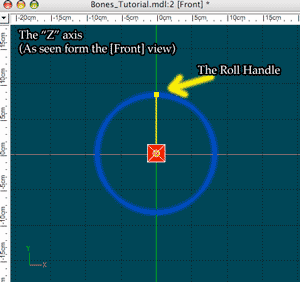 The blue circle in the illustration shows the axis of rotation when rotating a bone on its Z axis only. The Roll Handle of the bone can follow the path the blue circle. In this case it would appear that the bone is twisting lengthwise. A better way to really see how this works with a bone would be in an “Action” window environment rather than in a “Model” window environment. We are going to talk about the differences between the two shortly.